President Bush, hoping to build on momentum from a unanimous U.N. Security Council vote on Iraq, said Wednesday that he envisions a wider role for NATO in post-occupation Iraq. Standing alongside British Prime Minister Tony Blair, his top ally in the war in Iraq, Mr. Bush said the two discussed NATO's role at a breakfast meeting. "We believe NATO ought to be involved," Mr. Bush said. "We will work with our NATO friends to at least continue the role that now exists, and hopefully expand it somewhat." 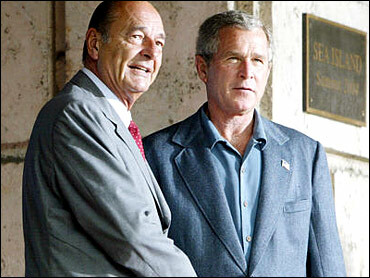 French President Jacques Chirac, however, expressed reservations. "I'm of course open to all discussion, but I won't hide it from you that I don't think it is NATO's purpose to intervene in Iraq," he said. "What's more, I don't feel that it would be opportune nor necessarily well understood. I am totally reserved about this initiative." Chirac said NATO involvement "could only be envisaged" if the Iraqi government requested it. NATO spokesman James Appathurai, speaking to Associated Press Television News in Brussels, said a possible future role for the alliance would depend on requests from the Iraqi government and decisions made by all the allied countries. "It could range from a geographic role — taking over a zone — to a functional role, such as training," he said. "It is just to early to prejudge and we don't want to rush to judgment. Iraq is a long-term challenge and we need a long-term perspective." NATO says 16 of its member countries currently have forces in Iraq. NATO also has thousands of troops in Afghanistan. The United States and its biggest allies are proclaiming that Tuesday's unanimous Security Council vote on a resolution that backs Iraqi sovereignty and gives the country's new leaders clout over a U.S.-led force will heal their bitter divisions over Iraq. Blair said the next step in the process was to make sure Iraqis can take care of their own security. "This is a process of change and we have to help people manage it," Blair said, adding that "It's not just about security measures. It's not just about force." Asked if he wanted to see a larger role for NATO, Mr. Bush said, "I think NATO ought to stay involved and I think we have a good chance of getting it done." He did not elaborate, but administration officials said the United States would like to see NATO get involved in training the new Iraqi army, in addition to having NATO members currently in Iraq remain there. Four of the eight industrialized nations at the summit here — Russia, France, Germany and Canada — have not sent troops to Iraq and said the U.N. vote had not changed their minds. A U.S. administration official, speaking on condition of anonymity after Mr. Bush's meeting with Blair, said the United States understands there are constraints on NATO's possible role given France and Germany's continued hesitation to send troops. Mr. Bush and Blair met for a private session before Wednesday's first business session of the G-8 summit. The G-8 leaders confronted an array of topics Wednesday. The opening session was devoted to economic issues, including the threat to economic growth from rising oil prices. Many countries see America's soaring budget and trade deficits as equally threatening to world prosperity. The world leaders were meeting over lunch with the leaders of six Middle Eastern nations in a discussion aimed at boosting Mr. Bush's initiative to promote freedom, democracy and economic growth throughout the Middle East. Mr. Bush hopes the plan will emerge as the central achievement of the summit. But his proposal has stirred deep suspicion in the region, and received a cool reception in Europe — even from Britain. Many governments have viewed the plan as unwanted meddling and three countries — Egypt, Saudi Arabia and Morocco — turned down Mr. Bush's invitation to participate in Wednesday's discussions. Several countries have also insisted that the success of Mr. Bush's initiative depends on resolving conflicts in Iraq and between Israel and the Palestinians. The U.S. cause in the Arab world has not been helped by Mr. Bush's support for Israeli Prime Minister Ariel Sharon's handling of the Israeli-Palestinian conflict, nor the scandal over the abuse of Iraqi prisoners by U.S. guards, which caused worldwide outrage. The G-8 was expected to endorse a scaled-down version of the U.S. plan. CBS News Correspondent Mark Knoller said there was no limousine or Secret Service driver for Mr. Bush on Wednesday. He drove himself to the morning gathering in an electric vehicle that resembles a golf-cart, painted with the colors of the American flag. Each of the leaders was provided with a similar vehicle painted to resemble their nation's flag, but some chose to sit in the back seat and have someone else drive. The vehicles are battery powered, emit no emissions, but can hit 25 miles per hour.